Actvity Summary: Listen to our podcast interview with the JR’s Chief Engineer to find out what his job involves, and then answer the follow up questions found on the next page. 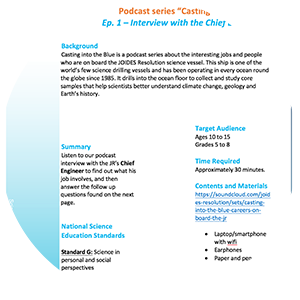 Casting into the Blue is a podcast series about the interesting jobs and people who are on board the JOIDES Resolution science vessel. This ship is one of the world’s few science drilling vessels and has been operating in every ocean round the globe since 1985. It drills into the ocean floor to collect and study core samples that help scientists better understand climate change, geology and Earth’s history.